The Hong Kong Polytechnic University (PolyU) has brought glory to Hong Kong by winning three Global Innovation Awards at the TechConnect World Conference and Expo 2017 (TechConnect World). It is the first time for a Hong Kong higher education institution to receive the award. PolyU is also the only awardee from Hong Kong. Dr Terence LAU, Director of Innovation and Technology Development of PolyU, said the University has been putting great efforts in developing high-impact research for coping with the changing and unmet needs of the society. "We aim at applying our research findings, through knowledge transfer, to make the world a better place for mankind and to benefit our society. The TechConnect Innovation Awards are certainly a recognition for our research efforts and achievements, and serve as a shot in the arm for our research faculty members." The "multi-functional nano-coating for glass" project conducted by Dr Lin LU has received keen responses from renowned multinational companies which indicated intention for collaborating with PolyU in further research and project development. In their meeting with PolyU delegates, many corporation leaders indicated that collaborating with institutions that develop cutting-edge technologies is an integral part of their innovation strategy. 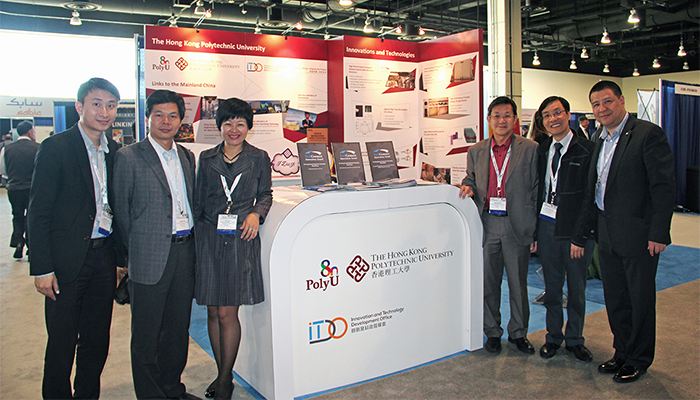 They believed that combining PolyU's unique technologies with corporations' global market access would help generate mutual benefits in the future. With large amount of outdoor near-infrared light transmitting through windows, drawing indoor temperature rise, many buildings in Hong Kong suffer from high-cost air-conditioning. In recent years, there were also repeated fatal accidents arising from cleaning windows in high-rises. The novel multi-functional transparent nano-coating for glass developed by PolyU researchers can help address the two problems at the same time. The super-hydrophilic self-cleaning coating has thermal insulation and photocatalysis properties. Besides blocking over 90% of near-infrared light and 99% ultra-violet light, the coating can also break down organic pollutants. Inspired by the limb structures of birds and insects in motion vibration control, the novel nonlinear X-shaped anti-vibration system developed by PolyU researchers has three unique advantages: nearly "zero response" to any vibration; high loading capacity; automatic high damping for strong vibration, yet low damping for small vibration. The technology can significantly reduce vibration in various engineering practices. It can thus be widely applied in railways, vehicles, marine and aeronautic engineering, mechanic and precise machines, robotics, and various civil structures like bridges, buildings, etc. The innovation has obtained patents of Mainland China, Hong Kong and the US. The research team has applied the technology in developing an assistive anti-vibration exoskeleton for hand-held drilling devices. The low-cost exoskeleton can significantly suppress vibration, and can therefore markedly help prevent hand-arm occupation diseases among construction workers. Offices with centralised air-conditioning are often being complained of having temperature set too low, leading to energy wastage, and adversely affecting the comfort, work efficiency and even health of the occupants.